As a real estate entrepreneur, I’m sure you’ve heard that half of all businesses fail in their first year, 80% are gone within five years and that 96% of all business fail within 10 years. I know just how hard it is to work a full time job, invest in real estate and create/run your business on the side. In 2017, I ended a successful career as a financial professional to pursue my own journey of full-time, self-employment, so that I could do the work that I felt most called to do. Having being groomed as an “employee”, I realized just how much I didn’t know about what it took to actually own and operate my own business. My first full year fending for myself was brutal. It was riddled with self doubt, overwhelm from all that I believed, and lack of clarity of what I needed to focus on next. As a result, that first year was the most difficult year, that I have ever experienced in my lifetime. However, it was all so worth it! With that being said, when I look back at all the challenges that I faced, I realized that it didn’t have to be so hard. 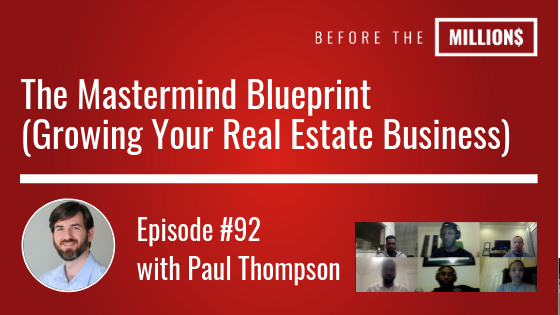 In this episode, Paul Thompson and I share how involvement in a healthy mastermind group as helped to turn things around for us and countless others on the journey to full-time self employment. Masterminds have had such a profound effect on me that I knew by launching my own I could help that that same effect on others and their businesses. Are you looking to build a successful business around your real estate investing efforts? If so, then I warmly welcome you to apply and be apart of the Before the Millions Mastermind. So that together, we can take your business to all new heights!